The Torah of Rabbi Akiva is a wisdom in which ideas, teachings of the Torah, are able to surpass and overcome the physical world. For Rabbi Akiva, the physical world was a container for the Torah that is taught in it. 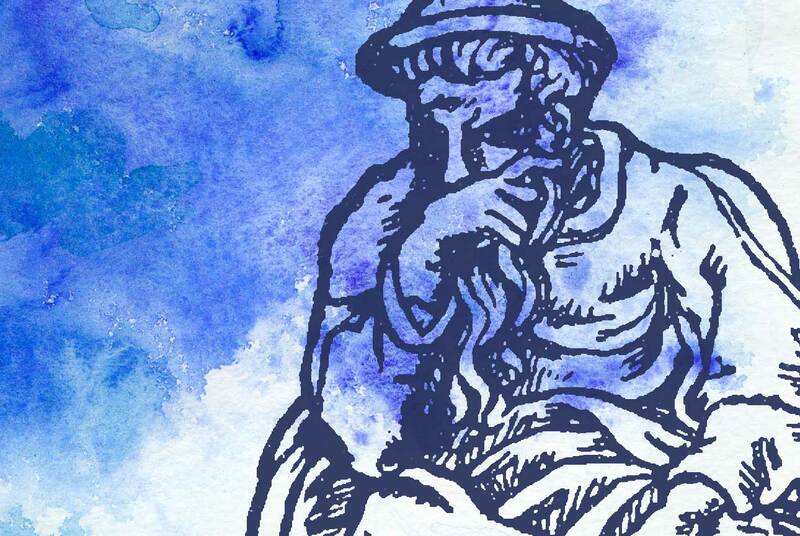 Akiva was a sage who lived in the land of Israel in the first century CE and is known for many things, among them his late start to acquiring wisdom. This story teaches Akiva that even he, unlearned and ignorant, had a heart which stony and impermeable as it might seem on the surface, actually had the capacity to change and grow. This ability to recognize that his heart can become something more that it had been, a well to contain ideas and meaning and the water of the Torah, is what enables his change, to move from life as a shepherd to life as a sage. The metaphor of Torah like water recurs in another famous story about Rabbi Akiva and the comfort of how to live in the world as a Jew, what enables Jews to be connected to their souls and to each other again and again is a story of the place of ideas in the physical world. There are, of course, many ways to read and understand this, but for our purposes here, I believe that the physical world is important to Akiva only as a place to contain and learn Torah, that he is comfortable with the text, and anywhere he can teach it. Without the text, the world is a dangerous place, but with it, any place can become a home, a useful lesson as the Romans eventually destroyed the Temple and Jerusalem in the year 70 CE. Akiva’s ability to transcend the physical world and time itself is a major element in the famous story about the Biblical Moses, who asks God to show him what will become of the teaching he is involved in transmitting in the time to come (BT Menahot 29b). God enables Moses to time travel in this story, to: “Turn to the future,” in the words of NYU Skirball’s Professor Jeffrey Rubenstein, to see Akiva in the study hall. Akiva is expounding not just on the words and letters themselves but the crowns on top of the letters, a feature that occurs in eight letters of the Hebrew alphabet as written in the Torah. Moses is perplexed about the meaning of what is being taught and does not see how it is connected to the text that he delivered to the Israelites in the desert. Akiva says that what he knows comes from Moses on Sinai, and Moses is relieved and comforted by this admission. Akiva’s teachings go beyond time; this the only story of time travel in the Talmud. This sense of the value of ideas over time suggests that it is not the physical world that is most important for Jews but something that goes beyond the physical, the element of time. Even in his death, Akiva is able to teach his students. Holtz writes of Akiva’s connection to his students, “In the moment of death, he does what he has done his entire career–he gives them an interpretation of the Torah. Akiva dies, in Michael Fishbane’s lovely phrase, in “Exegetical ecstasy… fulfilling a verse of Scripture.” Akiva is a living embodiment of the text in his death, he is one with both the text and with God. His physical being is less important than the Torah he teaches with it. This is a powerful thing. As we learn in the Song of Songs, “Love is as strong as death” (Song of Songs 8:6) Akiva is a figure who teaches us that the ways we behave can overcome any challenge from the hardness of a physical entity to death itself. For Akiva, the Torah is equivalent to love, and like love, it too can overcome death and remain enduring, despite whatever challenges one faces in the world. How Frankenstein Became More Human… And We Can Too.